Best to do it by motorbike! Enjoy the breeze, feel the freedom, smell the life, explore the landscape do not stuck in traffic ! Starting point of the tour is the north of Seminyak. We drive through Canggu into rural Bali. Apart from the main routes it goes on narrow roads through small villages towards Tabanan. Our first destination is the very popular sea temple "Tanah Lot"
The in the 16th century built temple sits on an offshore rock and is an important part of Balinese mythology. While passing traditional villages we get a look at the daily work of the Balinese people. We will visit a small brick factory as well as a pura desa, the gathering place of the villagers. Our way leads us now via rice-paddies and the town of Tabanan to the second highest mountain of the island, Batukaru. On its slopes lies the same named temple. Surrounded by jungle-like forest this temple provides a special mystic. Leaving Batukaru we ride on narrow roads, embedded in forest and rice fields, to our next destination, the Jatiluwih Rice Terraces – UNESCO World Heritage listed since 2012. The last corner opens a stunning view to seemingly never ending rice terraces and the mountains Batur, Abang and Agung. Here we will have our lunch. Well saturated, we follow the panoramic road to Bedugul, a town located in a huge caldera of the central massif. We stop in the center of the town to visit the Ulun Danu Temple, a religious site on-shore and off-shore the west side of the lake Bratan. Built in 1633, this Shiva dedicated temple is used for offerings ceremony to the Balinese water, lake and river goddess Dewi Danu. Going on the main road for some kilometers more before turning left to the small village of Wanagiri, located in approximataly 1600 m above sea level. The road along the rim has some spots with a good view down to the lakes. If there is still enough tme we could visit one of Bali‘s most beautiful waterfalls. A small, partly very bumpy lane leads down to the waterfall called Banyumala. After an additional 10 minutes walk we stand in front of the stunning falls. Refreshment can be taken in the cold water of the falls‘ up to 2 meters deep pool. Afterwards we head to Munduk to check in to the hotel and have dinner. First we leave direction north to visit a buddhist monastary with similar ornaments as the famous Borobudur temple in central Java. On our way to Yeh Mempeh waterfall we have to pass the crowded second largest city of Bali, Singaraja. Some kilometers further we turn right to approach the waterfall, one of the highest in Bali. After a refreshment break a quite curvy road leads us uphill to the rim of the Batur caldera. 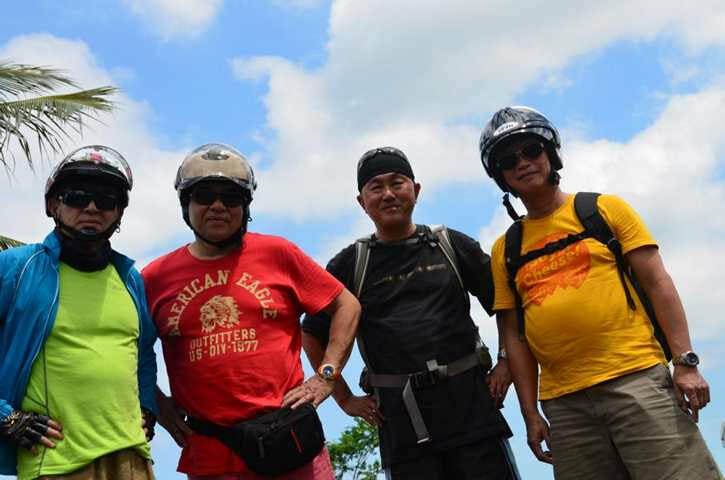 Biker’s heartthrob gets up too, 30 kilometers riding serpentines. We stop at a view point to take photos of the amazing scenery. Next step is to go down to the crater’s bottom to have lunch at a floating restaurant. Up and down on a small road along the shore of the lake we will reach Trunyan, one of the two villages where the acient Bali Aga culture is still alive. The funeral place is just approachable by boat. We will see there a bone and skull altar and, if lucky, bodies which are laid out and covered by leaves of the banyan tree to absorb the smell. Riding back the same road we start our loop around the famous Mt. Batur with its bizarre lava formations. Dependent on our arrival time we will do a short boat ride to see the Dewi Danu statue from lake side. After check in to our hotel we have the possibility to relax in a nearby hot spring pool before having dinner. The second day ends after a 1-km ride back to the hotel. If wanted we go up to the crater’s rim to watch the sunrise at approxemaly 6am. Back to the hotel and getting strengthened by a breakfast we get out of the crater again via different roads to visit the second important temple of the island, Pura Ulun Danu Batur which has a turbulent history. Now heading southward to Semarapura, the old capitol, and after few kilometers more we will have a break at Cafe among the rice fields near Sidemen. Close to Mt. Agung we turn right to continue our ride direction east. Approaching the coastline via a very tiny road gives the feeling being in heaven looking down to earth. Following the main road we reach Taman Sukasada, the old royal palace of Karangasem. There we will have another break for refreshments and to visit the palace as well. A small road leads us up and down towards Jemeluk. We will check in to our hotels. Then there is spare time for relaxation on the beach or the hotel pool. The day ends with a dinner at a beach restaurant in Jemeluk. Our fourth tour day starts again with a good breakfast. Now we jump on our bikes to visit the Lempuyang temple, the probably most beautiful temple of Bali. On the way to it we ride through a lush green valley and then on a narrow bendy road up to a mountain ridge and down to the temple. Short but exciting ride! Going steep downhill with a fantastic view to Mt. Agung we will hit the main road and reach after a few kilometers the water temple Tirta Gangga. Time for visit, refreshment and souvenir shopping. After another excitement, riding the Sibetan curves, we deserve our lunch break with stunning rice field view. 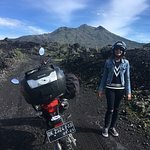 A 9-km uphill ride on a tiny, very steep road ends up near the Pasar Agung temple, located 1500 meters above sea level. Driving the same steep road back to Selat, the road leads us to the mother temple of Bali, Pura Besakih. Located on the slopes of Bali’s holy Mt. Agung, the temple is place of worship for all Balinese Hindus but hosts family shrines too. After a lot of cultural impressions we will check in to our hotel and have dinner. At 9am we start our ride today. On the curvy way to Bangli we have a stop at a waterfall in a canyon which provides great occasion to do photo shooting. Our next goal is just few kilometers away, the Kehen Temple. Founded by the Gelgel kingdom and completed in the 13th century, the temple was the main temple of the Bangli Kingdom, one of the nine kingdoms of Bali. Near the town Bangli awaits us Tirta Sudamala, a place of worship and purification ceremonies. Bathing and cleansing procedure are also open for visitors. Feel free to do so. After our lunch break in a small restaurant which offers traditional Karangasem food we will pass a mystically looking bamboo forest. Now we will indulge our passion by doing a 60km-loop up to the mountains and back. Small roads, few traffic...feel the freedom! Our deserved break will be at a coffee plantation where we can see the processing of the coffee beans. Beside the tasting of different kinds of coffee and tea we also have the possibility to try the famous „infamous“ Luwak coffee. A few kilometers to go before we check in to our hotel on the outskirts of Ubud. The evening is free. Our last tour day starts at 9:30 in the morning with a traditional Balinese dance performance in the nearby town Ubud. The Barong Dance is an animal mask dance symbolizing the fight between good –the lion-like Barong- and bad –the demon queen Rangda. After having picked up our luggage at the hotel the way leads us to one of the hidden beauties of the island. Gunung Kawi Sebatu is one of the least visited water temple complexes on Bali, yet is one of the most beautiful and tranquil. Back to the bikes, a short ride through the countryside brings us to Tegallalang with its famous rice terraces. After got lunch there is the possibility to walk among the rice paddies or just to catch unforgettable moments on some photos. The afternoon gets filled by a visit of the Monkey forest, located south-west of the town. After all we ride back to Kuta where our tour ends after the final 30km. We’re riding in a mixed group, riders should be able to handle a Scooter or motorcycle routinized! Lunch and dinner in “A la carte Restaurants”, soft drink during break. Minimum 2 Driver, maximum group size 10 drivers. pillion riders appreciated. Movies from our Helmet camera and drone. All photos will be uploaded to our server for all tour members. How do our customer think about this tour? Very good shop with competent staff and advice service. The quality of the offered Held (german product) and SHAD products is very good. Also the rack and case systems and further bike parts. 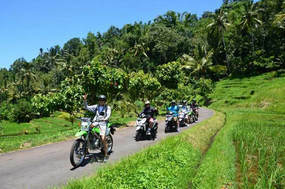 You will find everything what you need to explore Bali by motorcycle. Or even for peoples who life in Bali. I can recomment to everyone :-) Simply great.